is a poem written by our loyal friend and loving reader, Katherine, and it expresses the true essence of reason for being "A Ringer" ( a term which, by the way, should be applicable to both lovers of the films and the books!). It is the poem which inspired me to write "My Daydream", and taps into the reason why all human beings wish and dream, whether it be about history or fantasy! And let me hear the Elven-songs, and see their dark eyes bright. And let me learn to know a word or two of Elven-speech. O let me come to Middle-earth! – it can’t be far away. And let me see him wield the sword that has been made again. And let me see the wise old man who leans upon a staff. And let me see his fireworks! Let me meet Pilgrim Grey! O let me come to Middle-earth! O let me find a way. Let me join the Conspiracy that Merry planned – so kind! And let me meet the loyal friends who would not stay behind. And let me climb a mallorn-tree, and breathe the Elven-air. O let me come to Middle-earth! if only for a day. O let me come to Middle-earth! for there must be a way. 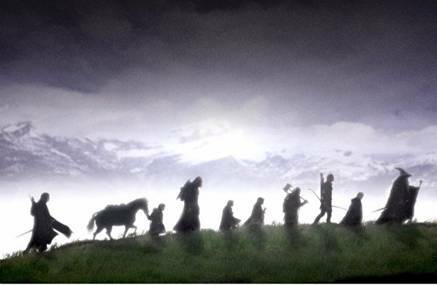 O let me join the Fellowship; pray make their number ten! And let me see the Company forge friendship without end. And let me see the eagle as he soars across the sky. For sometimes sorrow must be, if one shall rejoice again. And let me follow Frodo as he stumbles through the night. Please let me come to Middle-earth! O let me find a way. And let me see the Ents – I’m sure they’re quite beyond my thought. And let me hear the stout dwarf ask for a strand of her hair. O let me come to Middle-earth; if only for a day! I want to be there when the Elves reforge Andúril’s blade. Let me find Mithrandir and know the joy that hope can bring. O let me come to Middle-earth! O let me find a way! And let me see how men are who they are in darkest hour. I want to see the friendship grow between the Dwarf and Elf. Take me to Sam, in the Tower, and let me hear his song. And let me see the loving friends who bring them back again. O let me come to Middle-earth! For I shall try always. And let me hear Frodo resolve to do what he must do. And show me noble Shadowfax carrying the White Rider. And let me see how love at last shall triumph over hate. O let me hear victory ring upon the break of day! O let me come to Middle-earth! O let me come and stay. And let me share their journey, though I must go back again. How is it that, within their world, my own soul I can find? I shan’t forget their voices, if I never hear them ring! How is it that I read of them, and yet can hear them sing? O let me hear those voices! as they greet the light of day! O let me come to Middle-earth! There has to be a way! I don’t belong in this world here – where shadow reigns, it seems. I cannot love what this world loves – I’m tired of its schemes! And where they know what courage means, and see their duty through. They know there’s good beyond despair – and it’s worth fighting for! And, if I must come back, their faith will shine throughout my night. O let me wander in the woods and see what I might find. O let me meet my friends and know the lessons that they teach. I shall return a better person in this world to dwell. I know I’ll find a better self than what I used to be. O lead me on to Middle-earth! For I shall find a way! And let me share their sufferings when they make their last stand. I know that it will strengthen me when I return someday. O let me come to Middle-earth: it can’t be far away! Yes, I shall come to Middle-earth! – I know there is a way. "O Let Me Come to Middle Earth....."
Beautifully expressed reasons why fantasy is so appealing. Lovely song! For once, I can understand the sentiments of a poem. I also visit Middle-earth every time I read the book! :) Playing Lord of the Rings Online helps, too, because you can actually see what Tolkien was detailing in the story. A rare and excellent use of fourteeners! Bravo! Thank you, Meredith! I'm so glad you enjoyed it.